^ Lansdown, R.V. (2017). Phragmites australis (amended version of 2015 assessment). The IUCN Red List of Threatened Species 2017: e.T164494A121712286. https://doi.org/10.2305/IUCN.UK.2017-3.RLTS.T164494A121712286.en. Downloaded on 27 October 2018. ^ Saltonstall, K. 2002. 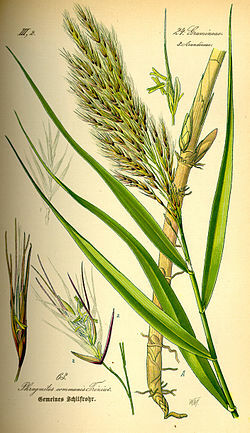 Cryptic invasion by a non-native genotype of the common reed, Phragmites australis into North America. Proc Natl Acad Sci 99(4): 2445-2449.